A Day in the Life of an Airline Pilot. He is an airline pilot by day, writer by night, and kid by choice. He has spent over 21,000 hours in the sky (nearly 2.5 solid years!) and is now Captain of a major US airline. He inspires other aviation enthusiasts to follow and pursue their dreams of flying, and reports and discusses aviation topics in an honest, candid way. As a professional pilot, Captain Eric Auxier (Cap’n Aux) is living his dream, and even more impressively, is dedicated to inspiring others to achieve their own. For anyone with a passion or dream of flying, or those seeking the highest office chair in the world, this is what you can expect from a day in the life of an airline pilot. Why are you madly in love with flying? Like a good marriage, with the day in/day out ups and downs, flying is something which has to be worked on. But that dream and love has never left me. Flying has always been a passion. What inspired your passion for aviation? I’m actually the first in my family to fly, and didn’t really grow up knowing any pilots. But I remember at age 7 sneaking down the hallway at 11am–way past my bedtime–to watch Neil Armstrong first step foot on the moon. That inspired my passion for aviation. Tell us about a day in the life of an airline pilot? As I comically present in my video, “Livin’ the Dream,” it ain’t all peaches and roses. You typically work long, odd hours, and only get paid while the plane is moving. Time spent between flights or during planning is sort of done “gratis.” Therefore, you could work a 12 hour shift but only get paid, say, 4-5 hours. Flying for a major airline, most of the planning is done for you by dispatchers. There’s no heavy lifting, filing flight plans, etc. And, it’s the world’s best office view! How many hours of flying did you need to accumulate to achieve your current position? And how long overall would you say you have spent in the sky? Like any business, it’s supply vs. demand. At the time, I got hired by my major airline at about 5,000 hours. I now have over 21,000 hours. That equates to nearly 2-1/2 solid years in the sky! As a captain of a major US airline, what are some of your responsibilities outside of flying? The nice thing about it is, when you set the brake at Point B, you’re off the clock and can walk away from your job. I’m also a freelance writer, blogger and book author, however, so I do feel a major responsibility to report and discuss aviation topics in an honest, candid way. A freelance writer, blogger and book author by night. Tell us about your career as a young pilot. I initially started my blog, “Adventures of Cap’n Aux” to tell all the tall tales I’d racked up over the years. Some of the first pieces I ever sold as a writer entailed mistakes I’d made in the cockpit that led to, shall we say, “adventures,” which ultimately offered up a cautionary tale or two. In fact, my “There I Wuz!” book series is a collection of those crazy tales from my blog and various magazine articles over the years. Volume 2 is slated for publication this June. The blog has expanded to cover all aviation topics, and especially to encourage those dreaming of a career in the cockpit. However, I also strive to present the business honestly. To that end, and going back to your question, my early career was quite rocky, as is common. You may also enjoy my post, “Top 10 Downers of an Airline Career”. You say your favourite vacation is not knowing which country you will wake up in the next day. Can you choose which flight paths you take, or are your destinations all pre determined? Well, again that’s for vacation, although admittedly I’ve gotten a little soft over the years! As for work, we bid for a monthly schedule, and we get that schedule about 10 days before the month begins. I can bid for destinations, days off, night or day schedules, etc. All kinds of parameters go into your bid, and you are “awarded” your schedule according to your seniority. These days, I am more concerned with when I’m flying as opposed to where I’m flying, so that’s more of what I bid. Frankly, when you’ve been to the same destination dozens of times, you are less likely to go out sightseeing. More concerned with when I’m flying. Got that early morning coffee! The Cascades. Sightseeing from the plane! How much free time do you have in-between flights? Normally 1-3 hours. But you need to start planning the flights about 45 minutes prior to departure. I’d rather have 1 hour between flights, so we can go go go, rather than have 2 or more hours that just stretch your day out and can lead to fatigue. What kind of excuses have you used in the past to fly somewhere? Haha good question! Pilots talk about the “hundred dollar hamburger,” which is simply an excuse to jump in the plane and fly somewhere for lunch–hence, your meal costs $100! Which destinations have you had the opportunity to explore due to your job? Well, all kinds, obviously! But, I fly mostly domestic, Canada, Mexico, Alaska and Costa Rica. Our 757 pilots also get 24-30 hours in several Hawaiian Island locations, so that’s a dream…although they pay for it by having to fly a long redeye home. We don’t do overseas flying out of my base (PHX) yet, so I don’t get to, say, Paris or Tokyo unless I’m on vacation. I’m not sure I’d want to do that kind of flying, anyway, as, like the 757 flights, it really beats up your body with all those time zone changes week after week. My favorite among my normal schedule would have to be Anchorage, or a long layover in New York, where we would stay in downtown Manhattan. Can’t go wrong with that! As an airline pilot, why do you have to be prepared for anything? Haha, well that was just a saying I had fun with in my “Livin’ the Dream” video. But, realistically, you really do have to be well-versed in your airplane’s systems and procedures. For airline pilots, we have very rigorous training standards, so by and large your pilot is ready for just about any contingency. Ready for just about anything. Speaking of which, I’m just about to release a video interview with Qantas Captain Richard De Crespigny, who safely landed his crippled A380 after the number 2 engine exploded, damaging all but one system. The emergency could not have possibly been planned or trained for, but nevertheless, after 2 gruelling hours inflight, he and his crew managed to get back safely on the ground. Can you bypass security in airports or do you have to take your shoes off like everyone else? Things are always changing and evolving, especially post-9/11. Now, for most airports, we have KCM, or Known Crew Member which is a system for crew members to help expedite our entry. What is the longest flight you’ve flown & how do you take breaks on a long shift? Around 6 hours usually gets you, on my A320-family Airbus, from KBOS (Boston) to KPHX or KLAX, or from KPHX to PANC (Anchorage.) We’re human, so we do need to leave our seat to “tend to our physiological needs,” as the regulations dryly state. Sadly, this little bit has been in the spotlight lately, with the Germanwings crash. In the U.S. we are already required to have another qualified crew-member or flight attendant up front while one pilot goes to the back. Around 6 hours of flying normally gets you. Tell us about your most memorable flight? Oh, my, so many! Again, that’s the reason I started my blog. I guess you’ll have to search the archives! My novel, “The Last Bush Pilots” won a Top 100 spot in Amazon’s 2013 Breakthrough Novel Awards, and is a fiction tale inspired by my very real adventures flying as a young bush pilot in Alaska. What happens if there is a passenger medical emergency? 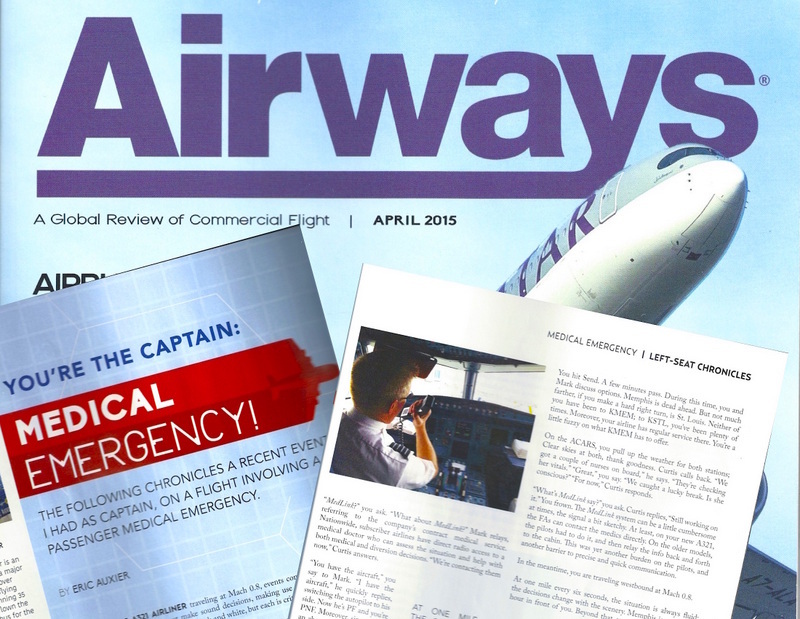 Now, that’s a timely question, as I just wrote a four-page piece for the April, 2015 edition of Airways magazine entitled, “You’re the Captain: Medical Emergency!” In it, I chronicle a real-life medical diversion I had, which also resulted in a heavy landing. I wrote it in such a way that the reader feels the “burden of command” of the captain, while making real-time decisions, with imperfect information, all while traveling at 10-miles a minute. Believe me, after reading this, you’ll be sweating! What are the greatest joys you get from your blog? As you’ll have seen in the video, “Cap’n Dillon’s Ecstatic Adventure,” one of the unexpected joys I’ve found in writing my blog is meeting aviation enthusiasts around the world. I regularly correspond with many of them, who often tell me how much I’ve inspired them to pursue their dreams. Well, it’s hard not to get teary-eyed hearing that, and it really encourages me to write more! “Cap’n Dillon” specifically is a young man who refuses to let his cerebral palsy get in the way of his aviation dream. I dare you to watch his “Ecstatic Adventure” video and not come away teary-eyed! Now, I take him on as many aviation adventures as I can. In fact, since his video came out, droves of pilots have come out of the woodworks to offer him flights in their plane as well! To see that boy’s face light up when he goes flying has become a serious addiction! Aux and Cap’n Dillon at PHX Tower. Off to Disneyworld with my new Make-a-Wish friends! What are some of your best war stories from the air? Well, that’s a good reason why my blog is still going strong after over three years: so many tales to tell! Search for “Flying a Fallen Hero,” “Grand Crisis Over Grand Canyon,” “I Nearly Wet My Pants” and, most recently, “Pilots of the Caribbean, Parts 1 and 2.” Or, make it easy and get my book, “There I Wuz! Adventures From 3 Decades in the Sky,” available in print or ebook. As a pilot, what are things you can’t travel without? To avoid the tedium of packing all the time, I basically have two of everything—shaving kit, tennis shoes, etc., that just stay in my bag. Nowadays, my most essential tool is my laptop, with which I can fill those long hours during overnights with writing my blog, articles and books. Getting ready for a long day. I’ve always had a soft spot for Japan (I took Japanese in college,) so one of my top dreams is to backpack the old samurai route from Tokyo to Kyoto. Also on the short list: Jamaica, Eastern Europe, the Viet Nam/Cambodia region, and more of Africa. All broad, vague goals, I know, but also many new areas only recently opened to tourism. I’d love to tour some more in the Middle East, but sadly that’s on melt-down mode right now. Most practical piece of advice for those wanting to pursue a similar career? From the moment you first step into a cockpit to learn to fly, cherish every moment: you’re ALREADY living your dream! This is a tough, volatile business, but if you are tenacious and stick to your vision, you WILL most likely be able to fly for a living. That does NOT mean you’ll become a 777 Captain, or make a lot of money. How far up the food chain you get is largely a matter of economics, timing and luck, so never be disappointed at where you end up. “Travel is fatal to prejudice, bigotry, and narrow-mindedness. A day in the life of an airplane pilot. Eric “Cap’n Aux” Auxier is an airline pilot by day, writer by night, and kid by choice. 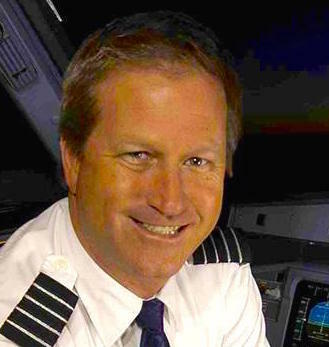 An A320 Captain for a major U.S. airline with over 21,000 hours in the cockpit, he is also a freelance writer, novelist and blogger. His second novel, The Last Bush Pilots, captured the coveted Amazon TOP 100 Breakthrough Novels, 2013. His 5th and newest book, There I Wuz! Adventures From 3 Decades in the Sky, Volume II, will be available on Amazon Kindle in June and in print in July. Mr. Auxier makes his home in Phoenix, Arizona. Read more at capnaux.com or follow Cap’n Aux on Facebook, Twitter, Instagram and Amazon. What an interesting article! Definitely not something you read about everyday. I was surprised the pilots only get paid for flying time. 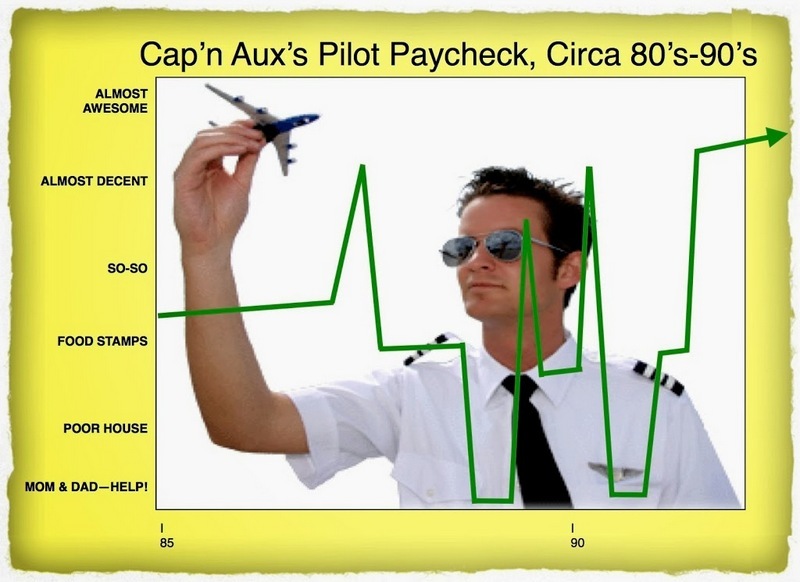 I knew that was the case for flight attendants but I always figured pilots were on salary. Loved reading this. Glad you enjoyed it Katrina! I had thought the same actually re pilots being paid on a salary, though I guess we both stand corrected! Katrina. I’m glad you enjoyed it! To clarify, we are on a “salary” of sorts. Typically, we get paid a minimum number of credit hours for the month, and if we go over that amount of flight hours, we’ll get paid for that as well. Flight attendants are usually paid in a similar fashion. Fantastic article, Megan! Airline pilot, author, blogger…when does he have any free time?! I followed this same path about 5 years ago when I started taking flight lessons with the goal of landing a career as a commercial pilot. As I gained hours and began flying solo, I realized that my goals had changed and I just enjoyed flying for myself without wanting to make it a career. Here I am today, chasing another dream of being a travel writer- which combines the two nicely! Keep following your dreams and never give up or forsake others when you can be living ALL of them if you choose! Glad you enjoyed it Joel! Lol that’s what I was thinking too! Eric seems to be able to pull the most out of every day that’s for sure! 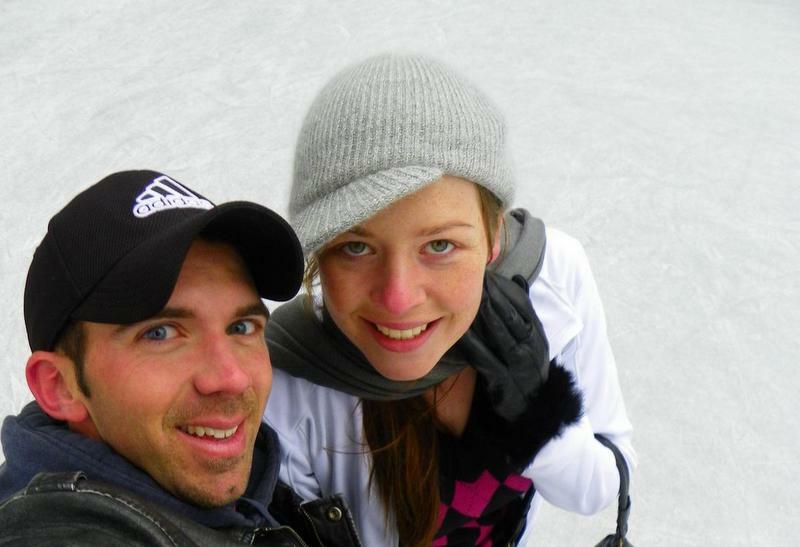 Travel writing and flying really do go together quite nicely – and AMEN to that; no need to forsake one dream for another when people like yourself and Eric are true testaments to the ability to live it all! I’m glad you pursued your dream of flying, but also found the proper path to enjoy it for yourself. I do think that many can enjoy the joys of flying without actually pursuing the career. I wish you the best in pursuing your travel writing dream as well! I really enjoyed this post. Very eye-opening. It is easy to believe being a pilot, like it is to be a travel blogger, is quite glamorous. Not so true but both great jobs. I’m so glad you enjoyed the interview Jennifer :) Absolutely – I think the grass is always greener on the other side, and while living your dream and waking up to a job you love doing every day is glamorous in itself, there’s definitely a lot of hard work which goes on behind the scenes which those on the outside never see. Glad you enjoyed the interview Alli – I think I would also use the excuse of a $100 hamburger to fly somewhere also – makes for a pretty darn cool story that’s for sure!! I liked that line too! Days can stretch pretty long in the cockpit, but I do always try to remember that this is my dream and I am grateful to have achieved it. You and Meg are right, the $100 is a fun concept, and always makes for a great tale! So cool! Pilots never get to share their stories. This was a great read. Glad you enjoyed it Jeremy! Make sure to head over to Amazon and pick up some of Eric’s books for more tales from the sky! Everyone’s got an interesting story, they just don’t realize it! But you’re right, pilots usually have lots! I have learned to strike up a conversation with each of my First Officers to hear their own “There I Wuz!” tales. Always fun to hear them! I would be curious to know how pilots manage to find love with those hectic schedules! Glad you enjoyed it Francesca! Eric really is just so interesting; I’ve always been fascinated as to what it would be like to be a pilot; I wonder how many women pilots there are actually! Loved Captain Dillon’s video also; that’s the thing which impresses me about Eric the most – he’s so generous with his time and actually gives back to make a difference. We need more people in the world like him! I live with my girlfriend now, who’s a flight attendant. Yes we have our challenges, but it helps a lot to have someone in the biz who better understands the reality of it. Thank you, Meg, for the kind words. Dig deeper into my vimeo page, and you’ll find several delightful videos with Cap’n Dillon! And in answer to your question, 6% of pilots in the U.S. are female! Which reminds me, dig back into that vimeo page and watch my interview with Jessica Cox: the world’s ONLY licensed pilot…with NO ARMS! Amazing woman, and one of my greatest pilot-heroes! Great interview Megan, one of your best. A ‘sneak peek’ for many passengers of what flying is like when on the other side of that closed cockpit door. If any readers are interested, this is a link to a review of Eric’s “Last Bush Pilots”. I really recommend that novel. Thanks for the comment and the link! I really appreciate your warm review. I’ll take a comparison to Mark Twain any day!! Great interview! I was thinking of doing the similar post as one of my friends is learning how to become an airplane mechanic. Would be interesting to get some insight knowledge from him, too! Thanks! Great idea to interview your mechanic friend. They are one of the unsung, behind the scenes heroes of our industry! It’s so true! What a fascinating lifestyle, I can’t believe they only get paid while the plane in moving – that seems insane. But I guess those hours must be very well paid…. Yes Mark Twain is always full of wit and wisdom! I think that’s the first blog interview of an airline pilot I have ever read! Loved it! I’ve always tossed around the idea of becoming a flight attendant and find the realm of aviation fascinating! Loved the video and learning about this pilot. Sometimes when in the air I tend to forget about the pilot who lives to make us safe! It’s a fun but tough lifestyle, but if you love to travel it may be a great career for you. Thanks for remembering us up front, especially in light of the sad news with Germanair. We are all human, with human issues, but we are proud to give you the safest ride possible. There are times that it has made me wonder how is it like to be a pilot in and out of the cockpit area…Thanks for this post. This is a very interesting read. You’re welcome. Glad you liked it! A view from the other side! Great getting to know behind the scene. Awesome stuff! Having lived in the U.S. Virgin Islands,I have a soft spot for the Caribbean! Good read and enjoyed the videos. Yes, it’s always an adventure for a kid (or “avgeek”) to visit the cockpit, and I love to invite them up whenever possible! But you’re right, sadly, we’ve become the cattle car, and everyone complains when we arrive 30′ late. Wow, that is really cool! I had no idea how much time and effort goes into being a pilot in the first place. It’s one of those things that you never really thought about, but you’re glad you know now that you do. Thanks so much for writing! So glad you enjoyed the interview Liz :) I find it fascinating to see behind the curtain too. Hi Mobina, so glad you enjoyed the interview, and congrats on finish your last year of high school! I’m glad we could provide you with some insight into the life of a pilot if this is one of the careers you are considering pursuing. Wishing you all the best – if flying as a commercial pilot is your dream, go for it! My name is Alan Carr and I am with GlobalAir.com. While doing research I came across your site and was impressed with your aviation information and resources. I was hoping you could take a look at our site and possibly add us as a resource to this page. I think we will be a great fit and I look forward to hearing back from you. Let me know what you think! Hi Alan, thanks for reaching out – feel free to send us an email to meganjerrard@gmail.com and I would be happy to forward our options for advertising. Thanks! My Dad wanted to join the flight corps during WWII but didn’t as he would have to leave his buddy who he enlisted with from back home, alone. Thus he gave up on flying and became an over the road tractor trailer driver. Later in life he and I began a medical distribution company in NY. It was successful enough to allow him to sneak out and fly. He finally got his license at age 60 and would fly every chance he could. He was born to be a pilot and finally was! What a wonderful story Ken, it sounds like your dad was an incredibly loyal guy to put his dreams aside to be there for his mates. I’m so glad to hear that he did it in the end!